The UK government has released further details of its intended approach for the 1st capacity auction, now scheduled for December 2014. These provide information on factors such as bidding rules, auction process and the publishing of information to the market. DECC has also confirmed that 15 year capacity agreements are available for new build plant. This is likely to provide a bigger relative benefit to OCGT vs CCGT plant. Most UK asset developers are focused on CCGT development. But the Capacity Market brings OCGT investment back on to the table. The UK government has released further details of its intended approach for the 1st capacity auction, now scheduled for December 2014. These provide information on factors such as bidding rules, auction process and the publishing of information to the market. DECC has also confirmed that 15 year capacity agreements are available for new build plant (rather than the initially proposed 10 years). This should materially reduce the cost structure of new build plant. Importantly it is also likely to provide a bigger relative benefit to OCGT versus CCGT plant. Most UK asset developers are focused on CCGT development. 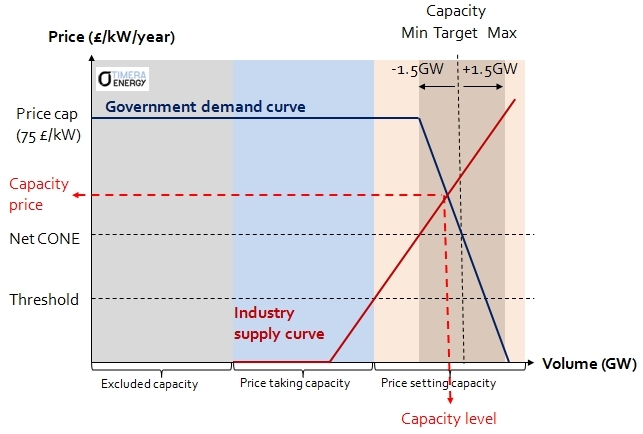 But in our view the Capacity Market brings the OCGT investment option back on to the table. DECC’s Capacity Market policy team released a ‘working synthesis’ specification paper in early April. The paper emphasises the ‘work in progress’ nature of some of the information announced. But this paper has clearly been released to provide a guidance update on DECC’s intentions given the rapidly approaching 1st auction. 75 £/kW auction price cap in 2012 terms – escalated at CPI to delivery year. Price taker/setter threshold to be published at a later stage (based on net CONE). 15 year capacity agreements are now available for new build plant, but DECC refurbishment agreements remain limited to a maximum of 3 years. Refurbishment and new build capacity thresholds confirmed as in Oct 2013 (i.e. 125 and 250 £/kW), note that this is on de-rated not nameplate capacity. Non-performance penalties are to be capped at 200% of monthly capacity payment revenues, with an overarching annual cap of 100% of capacity revenue. DECC’s aim is to include interconnectors in the 2015 auction. There are no standout surprises here, but these details provide some further clarity to feed into pre-qualification submissions and bidding strategy development. The diagram below that we published previously, is a reminder of the key elements of the capacity market structure. DECC has also provided some more clarity on how the auction rounds may evolve. There will be up to 4 auction rounds per day for up to 4 days. DECC suggests it intends to step price down in small decrements. An example of 5 £/kW is given, which is consistent with the 75 £/kW cap and maximum of 16 auction rounds. A full price schedule will be published as part of the auction guidelines. Which CMUs said they will be retiring / unavailable (and so not had their capacity deducted from the demand curve). However during the auction information release will be limited to how much spare capacity there is at the conclusion of each auction round. This again raises a key question as to how much information players will actually gain from one auction round to the next (e.g. on implied energy market expectations). And whether there will actually be much market participant adjustment of capacity bids through the auction rounds. The government also retains a key ‘get out of jail’ card. DECC intends to require all pre-qualified participants to confirm auction participation 10 business days prior to the 1st auction. This includes whether they are price takers or setters and their intended length of contract. Two business days later a list will be sent to the Secretary of State who has the ability to cancel the auction if it is not deemed to be sufficiently liquid/competitive. Given the market design complexity, remaining uncertainty and tight timelines, it would seem a prudent strategy for market participants to have an auction delay contingency plan close to hand. UK generation asset developers have historically focused on CCGT plant. From a total asset margin perspective this makes complete sense. CCGT have a clear efficiency advantage over OCGT and with 30GW of existing CCGT capacity merit order competition is fierce. As a result it is hard to build an OCGT investment case based on significant energy margin returns. However the availability of 15 year fixed price capacity agreements may change the UK power market investment landscape. With a capacity price cap of 75 £/kW/year, new build CCGT plant will still need to bank on recovering a healthy energy margin (given capital costs in excess of 100 £/kW/year). But energy margin expectations may be heavily discounted by players given the potential for capacity overbuild and general market uncertainty. CCGT plant may still be the best solution on a total margin basis, but the capacity market design is swinging the balance back towards OCGT assets. An OCGT investment case will revolve principally around capacity margin. So CCGT investment concerns over energy margin expectations and tolling agreements disappear. OCGT capital costs are also significantly lower than for CCGT. And if plant margin is covered under a 15 year capacity agreement, there are some attractive leveraging options. There do not appear to be many ‘auction ready’ OCGT projects out there. Yet a credible OCGT development option may undercut new build CCGT as well as being a valuable diversification opportunity for generation portfolio players.